Every year I try really hard to celebrate a Christmas where Christ is actually present. It's harder than it sounds! My solution is to try to get as much of the "stuff" as I can done early, ideally by the end of November. But even then, I somehow end up having (at least) one nervous breakdown on or around December 15th, usually having something to do with assembling cookie plates or paying out the nose for expedited shipping for the gifts I forgot until the last minute. This year, I have much less energy than usual. Soooo much less energy. I was almost disappointed at my last ultrasound to see that I wasn't pregnant with twins — I thought that surely just a single fetus couldn't sap my life force this way. But it has, and I'm pretty wiped out. And I haven't done anything for Christmas yet. So one of the things I've been including in my nightly prayers (that is, when I don't just drop unconscious after dinnertime) is that I can find a way to celebrate a Christ-centered Christmas season even though I have precious little time or energy to put a plan together. 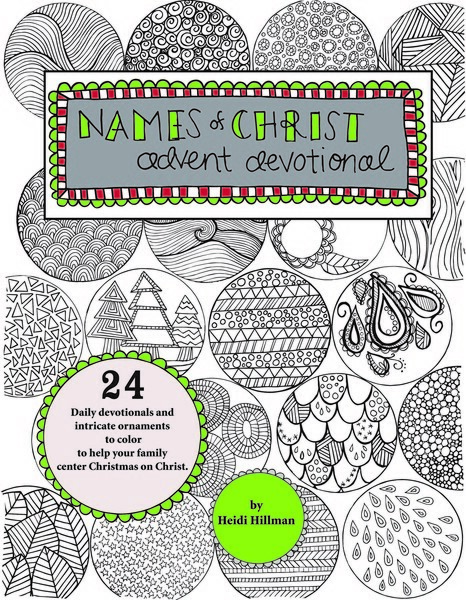 What fell into my lap was this Names of Christ Advent Devotional from Heidi at A Lively Hope. Heidi sent me a free copy to review and I'm so excited to use it. Other than making sure there's ink in my printer, the planning part is taken care of for me. There are 24 ornaments, one for every night of Advent for my kids to color while we read a Bible verse and talk about a different title given to Jesus: "Prince of Peace," "Light of the World," that kind of thing. 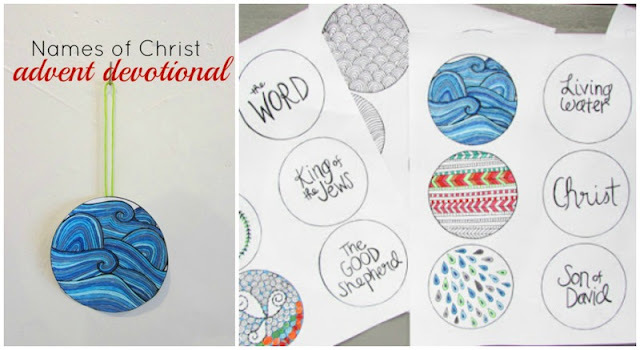 Coloring or drawing helps my kids to sit quietly enough to listen — we do this all the time in church and believe me, it helps! This is called Rafflecopter, by the way. Don't be afraid of it. It doesn't bite or make you promise your firstborn or steal your identity or anything. 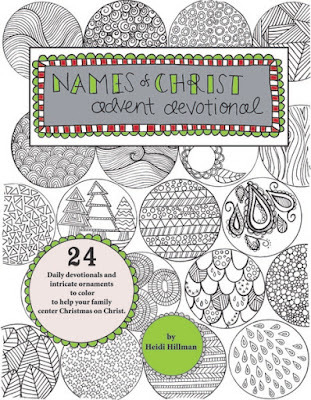 Just helps you win one of the two digital copies we're giving away of this Names of Christ Advent devotional. Winners will be chosen randomly and Heidi will email you your digital copy in plenty of time to get things all printed off and set up before December 1st. Best of luck to you! Love any chance to make Christmas more about Christ!! Looks like such a fun activity. My favorite thing about Christmas is being with my husband and kidlets and seeing their joy at giving presents to each other to make their siblings happy! Thanks for sharing your story! Your collection sounds awesome. We love the Fisher Price nativity set and my kids have played with it for many, many years. Thanks Heathen - I mean Sam. Just kidding. ;) I love your input on my blog and how you're not afraid to voice your opinions even on my religious posts even though we come from different places. I think it's awesome that you want your kids to know the origin of Christmas. I can relate to this because I want my kids to learn all about religious holidays celebrated by other religions. Even though we don't personally celebrate them, I feel like it's important for them to understand and especially respect the meanings behind those holidays. Family Christian stores have several kid's Nativity sets. I'm thinking of buying the Veggie Tales one. This is wonderful! I'm excited for the chance to win! I'm all about keeping Christ as the focus of His own holiday!! Thanks to both of y'all! This devotional sounds perfect to do with my family. I love how the coloring is great for any age! My favorite thing about Christmas is the music! I love how we can hear Christmas music (even Christ centered songs) when we are out shopping in the mall. But, the best part is singing Christmas songs as a family or going to a Messiah sing-a-long! Thank you for sponsoring the give-a-way. Lovely giveaway! My favourite part about Christmas is everything leading up to it... the anticipation and preparation of my heart for the gift that is Jesus - it's something I savor every year. Yes, that is so cool to hear the word 'Christ' on FM radio and over the loudspeaker at JC Penney! I love the calendar! What a great way to help our family to focus on the reason and true meaning behind Christmas! Are you sharing your Christmas ornaments? I'd love to have them for my grandchildren. Yes! You can enter the giveaway by logging into Rafflecopter with your name and email, and there are options to earn entries. You can do any or all of them. You can leave a blog post comment about your favorite part of Christmas, visit me on FB, tweet about the giveaway, share the giveaway on FB, or subscribe to my blog by email. But you have to click the 'I Did This' button on Rafflecopter so I know you did it! Best of luck. I think this is my first Rafflecopter attempt... I can't get my 10 YO son interested in ANYTHING church. He doesn't like coloring, but I'd like to try this, anyway! Good for you! I hope you find something that reaches your son. We haven't dealt with a kid who didn't like church yet, but with 5 and 1 more on the way it's probably bound to happen sometime, at least for a phase. Most years we have the same problem (babies eating/breaking ornaments) so the bottom 1/3 of our tree is usually bare. :) Enjoy your real tree! My favorite part of Christmas is how it focuses our attention on God's love for humanity. It's as if at this time of year His love reaches through people and everyone becomes a little more kind/attentive towards one another.